This week the Diva gave us the challenge to use purple in our tangle. I went on and used all purple in this one. I have several purple pens and wanted to explore with those a bit. 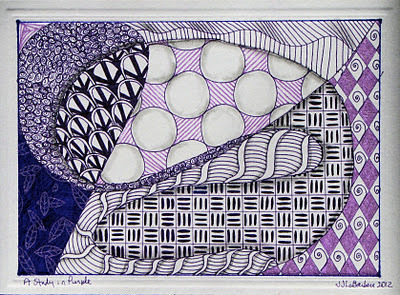 I used a purple Micron size 01, a Pentel Sunburst metallic gel pen and a Bic Mark It ultra fine point marker. The micron works the same and as well as the black pens that we all use. The ink is dark though. You know it's purple, but I think I would like a lighter color if I was going to use it a lot. The Pentel is a nice pen. The point is not fine, it's medium. The sparkle of the metallic is nice and I hope that you'll be able to see it in the photos. The Bic was just used a little as it bleeds a bit. I used a note card for this challenge. It started as a trial and I just went with it. This challenge became a chance for me to explore the ink more than the color. I wanted to see how the inks behaved and worked together. I really ended up exploring patterns as well. The light purple is the Pentel and the Bic is in the lower left corner with the Pentel over the top. There in the lower center is a new tangle that I've decided to call Whistler after James Whistler. I saw this pattern in the Peacock room. The peace sign looking one is another new one that has no name yet. I'm working it out and once I think of a name I'll get the steps done and posted along with Whistler. Any suggestions on a name? This was a fun challenge. I think the purple and the different pens allowed me to be a bit more free than I usually am. Your trial of inks, shades and tones turned beautifully creative. What a wonderful project and it makes a beautiful card. It's a great mix of tangles and use of purple. This is a wonderful study in purple, pens and color. Love the dimension created. Love this tile! The second I saw that new tangle, Whistler, I was wondering what it was. It has such a great graphic quality. How do I make a wolf whistle via internet comment? I love this tile. I agree with Erin - Whistler is a graphic that is easy on the eyes.